Cartervil le, IL: Luke Bogacki ended the 2015 racing season on a high note. After a lackluster start to the season, the two-time NHRA national champion found his stride in a big way, going on an unprecedented streak of 29 consecutive round wins in Super Comp that included national event victories in Brainerd, St. Louis, and the grandaddy of ’em all: the NHRA U.S. Nationals in Indianapolis. 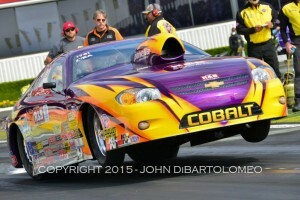 When his NHRA season came to an end, Bogacki also made impressive showings on the year end bracket tour. Although he didn’t notch a late season victory, he was among the final entrants standing at the C.A.R.S. 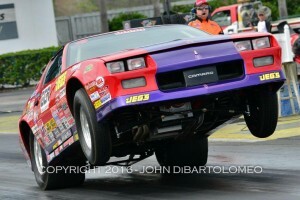 Million, as well as the annual winter series events in Valdosta, GA, Bradenton, FL and West Palm Beach. Four months away from the track did nothing to cool the 34-year-old professional racer. 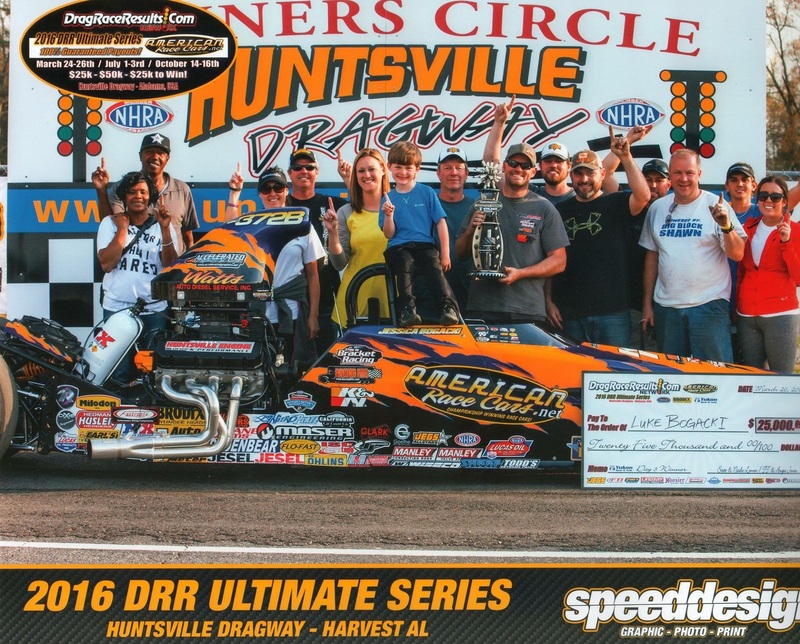 After a winter-long thrash, he debuted his immaculate new American Race Cars built, K&N Filters backed dragster at the DragRaceResults.com Ultimate Series event in Huntsville, AL in late March. While he didn’t win in his first appearance with the new car, he managed to find the winner’s circle anyhow. 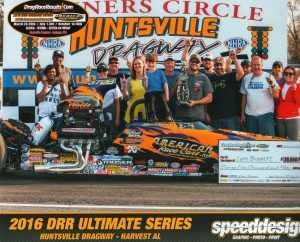 Driving his wife Jessica’s American Race Cars backed dragster, he earned a $25,000 windfall in Hunstville. 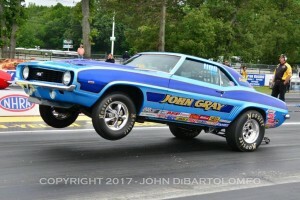 In addition, he advanced to the final 9 cars in the $50,000-to-win main event, which put him in the lead of the season-long DragRaceResults.com Ultimate Series points battle (the season champion takes home a new American Race Cars dragster valued at over $35,000!). After a brief stop at home, Bogacki and family set out on a long trip to Las Vegas, NV in their Racing RV’s rig. There, he made his NHRA debut with the new K&N Filters hot rod, and his season debut in the team’s Racing RV’s backed, Charlie Stewart Race Cars built Corvette roadster Super Gas entry. In addition, multi-time national champion Dan Fletcher drove Jessica Bogacki’s American Race Cars dragster in Super Comp. 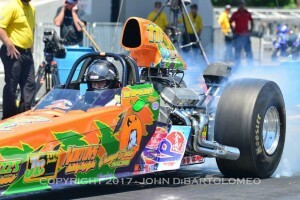 Although Luke’s weekend was cut short in Super Gas with a round one defeat, both of the LBM Super Comp dragsters went deep into eliminations at the DENSO Spark Plugs NHRA Nationals. In fact, Bogacki and Fletcher met up in an epic quarterfinal tilt, with a bye run to the final round on the line. There, Fletcher laid down an unbeatable .001 reaction time and paired it with a near-perfect 9.049 ET (9.05 index) to top Bogacki. He then went on to win over Steve Williams. The victory marked Fletcher’s 96th NHRA National Event win, and his first in the Super Comp category. After a rainy weekend in Las Vegas, in which the Division 7 Lucas Oil event was postponed due to weather, Bogacki set his sights on the Spring Fling Million, a weeklong big dollar bracket event at the same facility: The Strip at Las Vegas Motor Speedway. 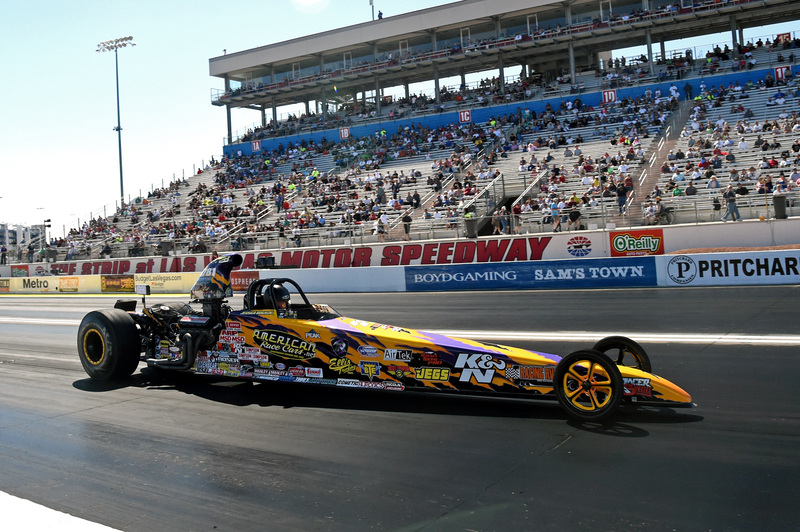 There, Bogacki wheeled his K&N Filters dragster to it’s first win, a $20,000 triumph in Thursday’s main event. 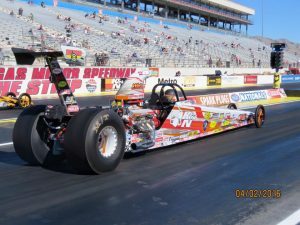 He went deep into eliminations in the following day’s Spring Fling Million, running his winning streak in the car to 15 consecutive rounds, before falling to eventual winner Jeff Verdi in round 6. He also advanced to the fifth round of competition in Jessica’s American Race Cars dragster, resulting in another solid payday.